We the global family of the indigenous people of Biafra (IPOB) consider it important to commend every IPOB member and our gallant volunteers who made it possible on our last outing despite the stupidity and predictable intimidation from the Fulani Police Commissioner in Anambra State. It takes courage to defend the freedom and rights of the oppressed, therefore what IPOB has done and continues to do in the face of overwhelming repression and brutality must be commended by all thinking people. We thank the Volunteer Squad across Biafraland for carrying the message of ‘no election’ into our towns and villages. Our peaceful event across Biafraland on Friday proves the total fomidablity and resoluteness on the side of Biafran citizens towards the collective effort to restore Biafra. It is important we remind this despotic Nigerian Government and her security forces that days are coming when they will no longer sneak up behind IPOB rally formations anywhere in Biafraland and be spared. During the recent peaceful street evangelism conducted by IPOB across Biafraland, only the Fulani police commissioner in Anambra State ordered his rag-tag police to attack our people because Obiano gave him the permission to do so. IPOB Intelligence has discovered a grand plan by Obiano and his Fulani masters in Aso Rock to commence a mass arrest of innocent people in and around Nnewi town as a way of creating disunity amongst the people. Obiano and IG of Police are hoping to drive a wedge between Biafra frontline agitators and our people doing businesses in Anambra State. They have resorted to going after and arresting every able bodied person they come across. This morning they started what they termed house to house searching which is a cover for mass arrest and detention of innocent people. Now that Abba Kyari, the power behind the throne is reported to have died in London, anybody close to the Fulani cabal in Abuja must warn them to instruct Anambra State Police Command to stop the ongoing harassment of innocent citizens and to immediately release the innocent traders they arrested on Friday evening. We wonder why Nigerian government and her security agencies including Gov. Obiano would accuse IPOB members for their missing guns and rifles, when everybody knows that Nigerian police is the most corrupt institution in Nigeria and the very embodiment of lies. No sensible person believes the lies they concoct on a daily basis. 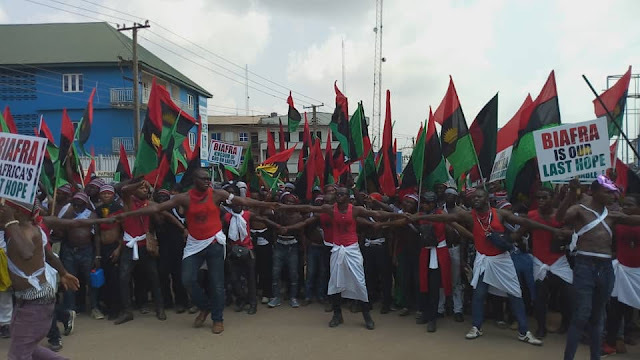 IPOB doesn't move with guns and cannot do so until Biafra sovereignty is restored. We are warning Nigeria Government headed by Fulani caliphate including the Nigerian Police to leave IPOB family alone and release those arrested unjustly in the name of arresting IPOB family members.